Thanks to generous donors, 2012 was a great year. We completed 2 projects. 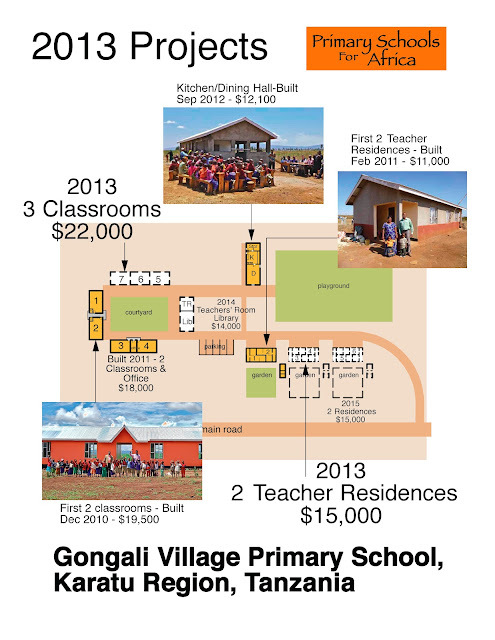 At the village of Gongali, we completed our 4th building; a Kitchen/Dining Hall to add to the 4 classrooms and 2 Teacher Residences built previously. 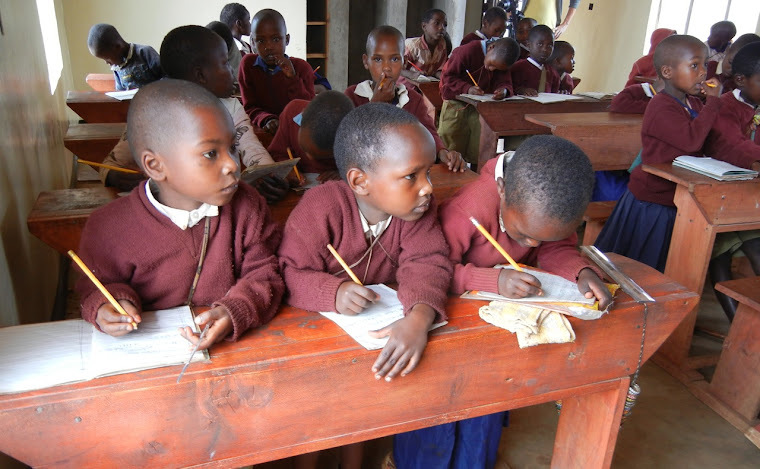 At the village of Kilimamoja, we built the first 2 classrooms. Once we start a school project, we must continue adding buildings every year until the whole school's building program is completed, otherwise the pupils cannot graduate into the next higher level of classroom. We have also realized that we cannot stop at just the classrooms. So we've extended our building program to include a Kitchen/Dining Hall, Teacher's Residences, water supply and electricity at each school site. The food program, where the village provides the food and kitchen staff, ensures the kids have at least one nutritious meal a day. Providing free housing to underpaid government teachers allows them to now afford a higher standard of living with their income redirected to better raise their children. No community can exist without water: to provide nutrition, hygiene and sanitation. The electricity will also allow computers (that have been donated by another non-profit organization) to be used in the classes. We are discovering that the school site is becoming a self-sustaining mini-community. The villagers are excited with the new facilities and are using them to grow their community spirit. At Gongali, one of the classrooms is now being used for church services. The Dining Hall allows wedding ceremonies and other community celebrations. Adjacent their residences, the teachers are raising chickens and growing grains and vegetables in a garden. They are happy to be raising their children here. The graphics below show our construction goals for the upcoming year. 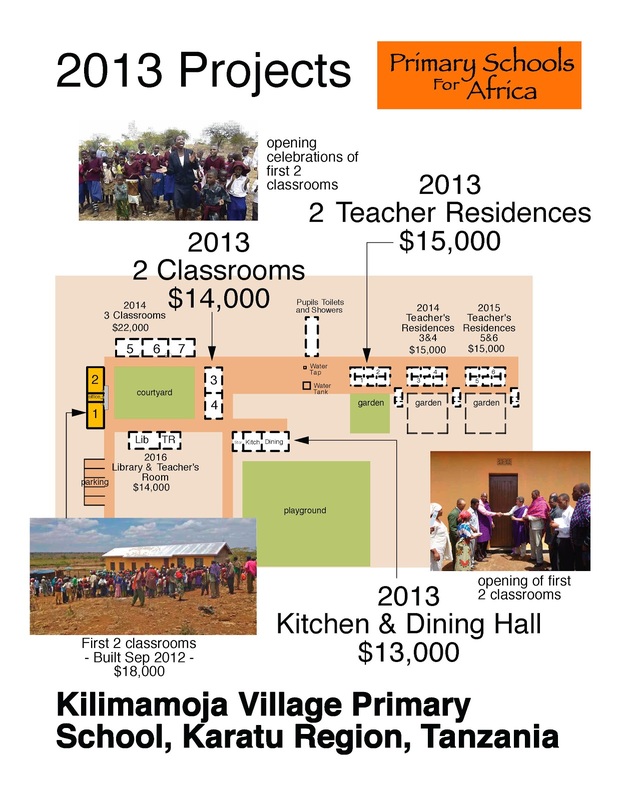 Alan will be going to Tanzania several times in 2013 to complete these projects. The first one, in Kilimamoja village, is the Teacher's Residence for 2 families sponsored by a retired BC Engineer and family. It will be completed in January 2013. We need to keep building to complete these schools sites and start new ones in other villages, and fortunately, we have had more and more donors joining our cause to allow us to do this. Individual donors have "purchased" classrooms, at $7,000 per classroom, and have dedicated it to a loved one, living or deceased. We will be providing a plaque mounted on the classroom wall. BC Ferries is currently raising money through in-house raffles to sponsor a classroom and as of today, 12 December 2012, are almost at their goal. We need in excess of $80,000 to complete these projects in 2013. We are currently at approximately 65%. 1. Sponsor a classroom, teacher residence or Kitchen/DiningRoom here. 2. Buy construction materials here. 3. Canadian schools; become a partner in our "Coins For Classrooms" initiative. 4. Be a member of our team to "Climb Mount Kilimanjaro" in Sep 2013. 5. Or simply, just send in any amount, no matter how small.